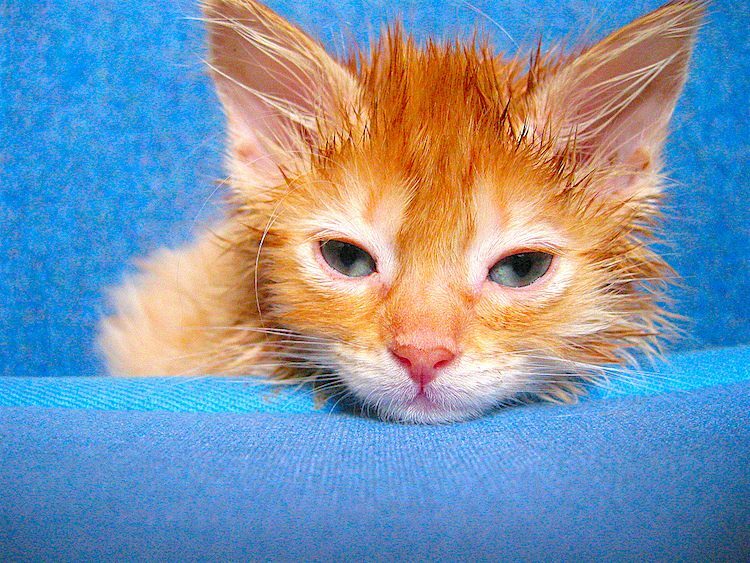 Ear mites are annoying for our pets and pretty gross all around. Here’s what you need to know about ear mites treatment in dogs, cats and rabbits. Ear mites are gross. They infect our pets’ ears and cause them discomfort. So where do ear mites actually come from? If we knew that, we could eradicate them, right? The existence of mites dates way back — we’re talking more than 100 million years ago. Ear mites are arachnids, in the same class as spiders, but they are babies compared to spiders, which date to 380 million years ago. During this era, lots of small mammals evolved, serving as hosts for ear mites to feast on. Because ear mites have been around just about as long as dirt, have predated humans and will probably live on long after us, eradicating them is not in the cards. Like other insects and arthropods, they are survivors, sneaky little things that can outlive dinosaurs and ice ages. So let’s figure out how to live with them on Earth — but not in your pets’ ears. This “dog” ear mite is also the mite found in about 90% of our cats. The most common way pets get ear mites is from another animal. That’s because these mites are highly contagious. 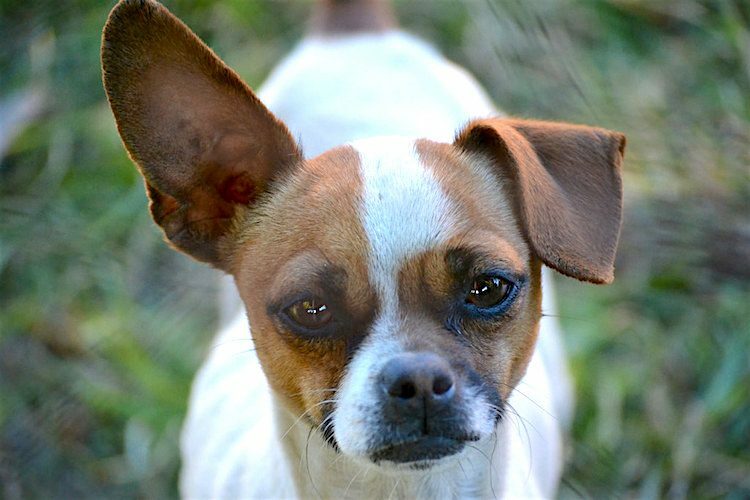 House cats and dogs generally must come in close contact with an infected animal to acquire ear mites. And you’ll want to treat a new pet with ear mites immediately. In the vast majority of well-cared-for pets, ear mites are rare. Most cases are seen in barn cats, strays, litters of kittens from outdoor moms, and puppies from puppy mills or bad pet stores. Kipper, a friendly rescued cat, had ear mites — thousands of them. Poor Kipper had so much wax plugging his ears that it was surprising he could hear at all. When we cleaned those ears, we stood open-mouthed at the quantity of thick black lumps. These days, ear mites treatment is easier than ever. With perfect vision, you can just about see glistening white dots that scurry from the light. However, there can be huge numbers (more than 1,000) deep in the ear canal, and you won’t see a single mite at the entrance. 1. Ear mites love earwax and skin cells but hate clean ears. So keep your pet’s ears clean to starve the mites of food. 2. Ear mites pass back and forth between pets. If your pets snuggle together, then you’ll need to treat all pets in the house. 3. Ear mites don’t just live in ears. Picture your dog scratching an ear. Your dog uses a back paw and digs it deep into the ear, probably with a groan of satisfaction. Likewise, cats who curl up with their head on their tail are apt to deposit ear mites on their rear end. 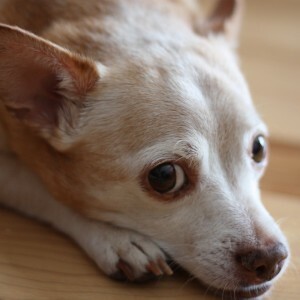 So paws and tails can harbor ear mites. 4. Ear mites can survive on bedding and soft furnishings, as can other mites. OK, to be 100% truthful, they don’t survive long in a dry environment (they dry up in warm, dry conditions), but the risk means you should wash the pet beds and regularly vacuum. Can People Catch Ear Mites From Their Pets? In the 1990s, a dedicated veterinarian, Dr. Robert Lopez, deliberately infected himself to see what happened. He reported an almost unbearable rustling and scratching sound deep in his ear. Dr. Lopez experienced terrible itching that interfered with sleep. But after less than a month, the infection cleared itself. In theory, there’s nothing to stop people from catching ear mites — but they rarely do. Often, the worst that happens is an itchy skin rash, and the mites don’t make it as far as the ear canals. Oddly, some infected kittens and barn cats don’t show symptoms of itchy ears. Because kittens have contracted the mites from their mothers and have basically had the ear mites their entire little lives, many don’t do that much scratching. Eventually though, without treatment, these ears can become badly infected. Down the road, all that scratching can lead to an ear hematoma or even a ruptured eardrum. First, get a definitive diagnosis of your pet’s problem from the vet. A quick look into the ear canal with the vet’s trusty otoscope will reveal the sneaky little mites. On top of all the big chunks of angry, brown, oily, waxy debris created in the ear by the mite, the magnification rendered by the otoscope allows us to visualize the tiny white creatures. They slowly travel over the dark mountains of dried mud, leaving itch and debris in their path. Ear mites can be treated easily with a prescription drug called Ivermectin. Before treatment, the ear canal should be cleaned out professionally to eradicate the debris clogging the ear canal, alleviate discomfort and ensure that the treatment is successful. Usually 2 treatments of Ivermectin used in the ear, orally or in a topical prep like Revolution (in the U.S.) or Stronghold (in the U.K.) get rid of the mites. Most people are amazed at the amount of disgusting stuff the vet can remove from even a tiny little kitten ear. And the kitten, cat, puppy or dog is very thankful once their ear can see daylight again. Many people think their pet has ear mites because of itchy ears, assume mites are the problem and buy an over-the-counter (OTC) ear mite preparation. But most animals don’t have ear mites if they’re older, cared-for house pets. Using an inappropriate ear medication with an OTC insecticide can irritate a mite-free ear and does not treat the primary ear problem, which may be a bacterial or yeast infection, allergic otitis or ear polyps (this occurs mostly in cats), to name a few ear complications unrelated to mites. 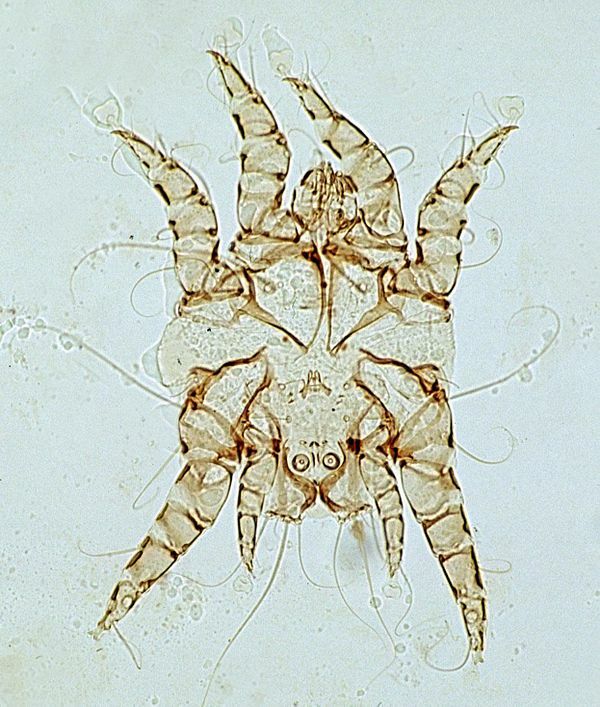 The rabbit ear mite is a different species (Psoroptes) from the dog and cat (Otodectes) mite. Typically, a rabbit develops severe crusts and scales that stick tightly to the skin. Don’t forcibly remove these crusts — they take the skin’s surface with it. Instead, seek systemic treatment from the vet to kill the mites. Then, over time, soften the crust with mineral oil until it is ready to lift harmlessly away. Is it just us, or do you feel itchy now? Ear mites will probably be around forever, but they don’t have to be around your house for more than a few days. Although they are found the world over and are millions of years old, they don’t have to infest any fluffy ears for too long if you get them treated promptly. Bowman, Anastasia. “Otodectes cynotis.” American Association of Veterinary Parasitologists. June 25, 2014. Archived at https://www.petful.com/wp-content/uploads/2018/12/otodectes-cynotis.pdf. Cornell Feline Health Center. “Ear Mites: Tiny Critters That Can Pose a Major Threat.” Cornell University College of Veterinary Medicine. 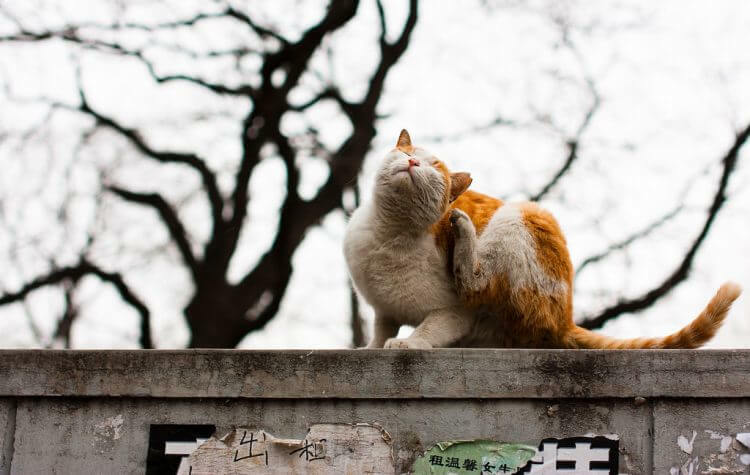 2016. https://www2.vet.cornell.edu/departments-centers-and-institutes/cornell-feline-health-center/health-information/feline-health-topics/ear-mites-tiny-critters-can-pose-major-threat. This article on ear mites treatment options was written by veterinarians, Dr. Debora Lichtenberg, VMD, and Dr. Pippa Elliott, BVMS, MRCVS. It was reviewed for accuracy by Dr. Elliott and was last updated Nov. 2, 2018.